NEW ORLEANS (AP) A couple of seasons overseas appears to have turned Darius Miller into the clutch jump shooter the Pelicans hoped they were getting when they made him a second-round draft choice in 2012. Miller hit four 3-pointers in the fourth quarter, when he scored 14 of his career-high 21 points, and New Orleans overcame a sloppy performance to beat the struggling Atlanta Hawks 106-105 on Monday night. DeMarcus Cousins had 22 points and 16 rebounds, and fellow All-Star big man Anthony Davis added 13 points, 10 rebounds and four blocked shots for the Pelicans, who have won five of six. 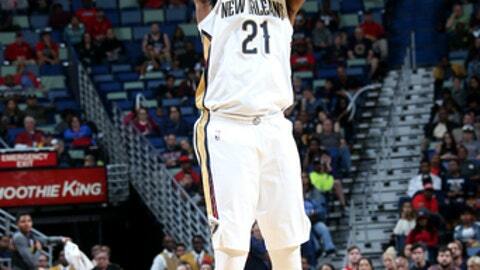 E’Twaun Moore tied a career high with 24 points for New Orleans. Kent Bazemore scored 22 points for the Hawks, who led by 14 before fading to lose their fourth straight. Bazemore missed a critical free throw with 37.1 seconds left. Atlanta still had a chance to take a late lead, but Dennis Schroder’s errant pass toward Tyler Cavanaugh sailed out of bounds with 3.2 seconds to go. Davis’ late turnover – New Orleans’ 19th of the game – gave Atlanta one last desperation shot with about a second left, but Bazemore was unable to get a clean look at his 3-point attempt over Jrue Holiday. Atlanta led 101-97 after Cavanaugh’s fourth 3 of the game with 2:41 to go. Miller responded with the first of three 3s in the final 2:19, including two in the final minute. His last, from the left wing, came after Holiday’s near turnover rolled right to the Pelicans small forward. Hawks: Atlanta took advantage of Pelicans mistakes to lead for much of the game and also hit 17 of 36 from 3-point range. Like Cavanaugh, Luke Babbitt and Marco Belinelli each made four 3s. Belinelli finished with 14 points and Babbitt 12. … The Hawks raced to a 32-23 lead after one quarter, led 50-45 at halftime and 80-78 after three quarters. … Atlanta had 10 offensive rebounds and 15 second-chance points. Pelicans: Rajon Rondo made his Pelicans debut following about a month of rehabilitation from surgery to repair a core muscle injury. He had two points and two assists in about five minutes in the first half. ”Adrenaline is still going, so of course I feel great. We’ll see how my body responds” Tuesday, Rondo said. … Holiday finished with 13 points. … Cousins committed seven turnovers and Davis five. Miller spent much of the past two seasons playing in Germany before Pelicans general manager Dell Demps gave him a second shot in New Orleans, hoping his role as a go-to scorer in Europe would translate to timely scoring back in the NBA. Davis said Miller’s performance reminded him of when the two were teammates on Kentucky’s 2012 national title team, when Miller projected confidence as a senior leader. Before the game, Pelicans coach Alvin Gentry said he was trying to emphasize better decision-making after a rash of turnovers this young season. His players did not respond particularly well in the first half, coughing it up 13 times. That helped the Hawks build a 45-31 lead before New Orleans stormed back to briefly tie it with a 14-0 surge fueled by 3s from Cousins and Moore, as well as Davis’ fast-break layup and putback dunk. Hawks: Return home to host Sacramento on Wednesday night. Pelicans: Host Toronto on Wednesday night.